Get your unique retro-style Halloween invitations. Take your Halloween party to the next level with a matching set of custom retro Halloween invitations, paper plates, and napkins. Each of the items is sold separately so you can mix and match your favorites. 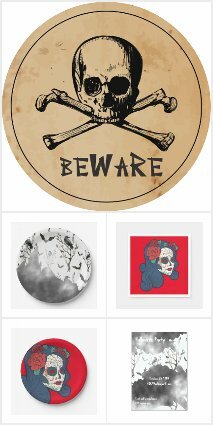 Choose from designs featuring sugar skulls, black cats, witches on broomstick, haunted castles and lots more. Not every design is available on each paper product. Don't miss our hand-picked favorite retro and vintage Halloween party invitations!